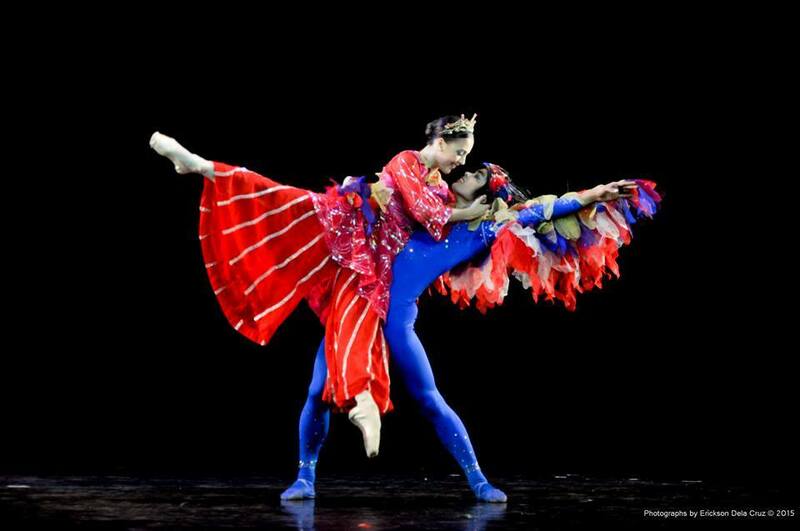 Enchanting tales of love, fantasy and adventure topbill "From Page to Stage," Ballet Manila's 20th performance season. 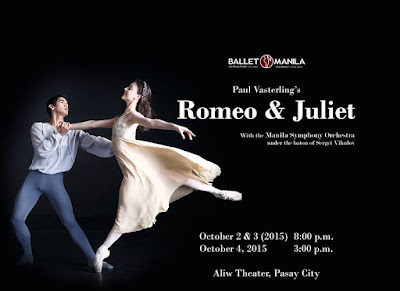 This is slated in August 2015 to March 2016 at Aliw Theater in Pasay City, Philippines. Celebrating literature with larger than life characters, story book and dance enthusiasts will be fascinated by Severino Reyes’ Tatlong Kuwento ni Lola Basyang, Paul Vasterling’s Romeo & Juliet, OsiasBarroso’s Pinocchio, Martin Lawrance’s Rebel and Alan Hineline’s Hansel and Gretel. Three magical stories about a princess' love for a bird, a hero in search of his sisters and the mystery behind an enchanted violin. Love conquers all in "Ang Prinsipe ng Mga Ibon," a captivating story of a princess fighting for love amid her father's disapproval. Choreographed by OsiasBarroso with enchanting music by national artists for music as arranged by Mon Faustino. The adventure continues with "Ang Kapatid ng Tatlong Marya" about a young hero’s search for his three bewitched sisters. The piece is choreographed by Ballet Manila Artistic Director Lisa Macuja-Elizalde with original music by Joey Ayala. And finally "Ang Mahiwagang Biyulin" explores the mystery behind a magical violin transforming an unkind rich man. Choreographed by Tony Fabella, the story is set to music by Ryan Cayabyab. Lola Basyang was the pen name used by Severino Reyes, the founder and editor of Liwayway magazine. Over 400 stories have been produced since he started writing in 1925. The material used for the production is based on Anvil Publishing editions. 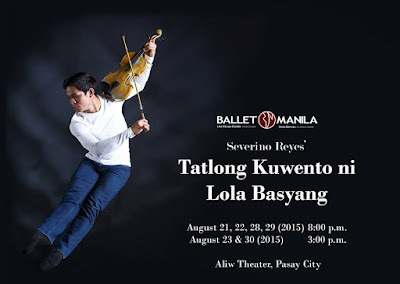 Severino Reyes’ TatlongKuwentoni Lola Basyang goes onstage at the Aliw Theater on August 21, 22, 28 and 29, at 8:00 p.m. and August 23 and 30 at 3:00 p.m. The Asian premiere of the unforgettable Shakespeare tragic romance interpreted by Nashville Ballet USA Artistic Director and CEO Paul Vasterling, known for his marvelous ballet translation of Shakespeare plays. In an interview with Nashvile Arts magazine, Vasterling explained the similarity between Shakespeare and ballet emphasizing that both are forms expressions that come with rules that need to be followed. "When you are able to work that out and the rules and the feelings become one, it’s magic. It leads to moments that will last forever," he said. Manila Symphony Orchestra with guest conductor Maestro Alexander Vikulov of the Mariinsky Theater will set the music for the passionate dance romance. Paul Vasterling’s Romeo & Juliet goes onstage at the Aliw Theater on October 2 & 3 at 8:00 p.m, and October 4 at 3:00 p.m. The stage is set for the world premiere of the best-loved story of Gepetto and his wooden puppet, as choreographed by Ballet Manila Co-Artistic Director Osias Barroso. Pinocchio was initially a one-act piece, and was a regular fixture in Ballet Manila's repertoire list. This year the full-length production is made more colorful and exciting with more characters, interesting twists, a magical dream brought to life. 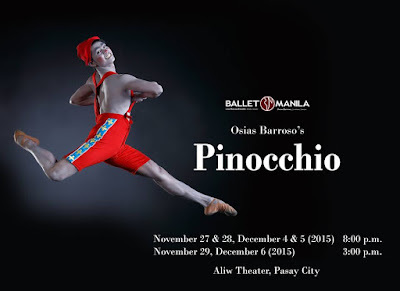 Osias Barroso's Pinocchio goes on stage at Aliw Theater on November 27 and 28, December 4 and 5 at 8pm and on November 29 and December 6 at 3pm. 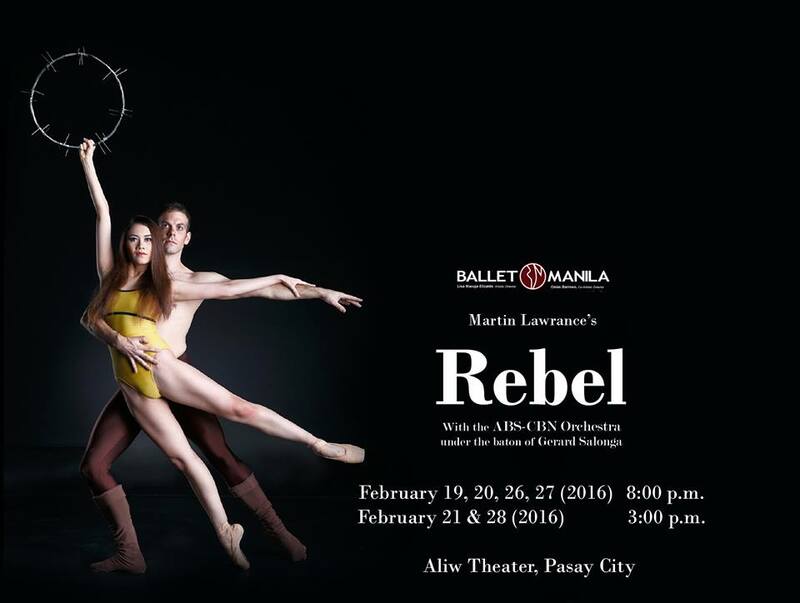 Ballet Manila performs Rebel, the group's version of the famous "Spartacus," a piece associated with Bolshoi Ballet. London-based choreographer Martin Lawrance of the Richard Alston Dance Company, will collaborate with Filipino playwright Floy Quintos, and musical director Gerard Salonga. Rebel the dance drama, will have the 1986 People power revolution as backdrop. Exploring themes of bravery and the struggle for freedom, the spectacular production also celebrates the 30th anniversary of the historical Edsa Revolution. The rich symphonic Khachaturian score will be executed by ABS-CBN Philharmonic Orchestra under the baton of Maestro Gerard Salonga. Martin Lawrence's Rebel, goes onstage at the Aliw Theater on February 19, 20, 26, 27 (2016) at 8:00 p.m. and on February 21 & 28 (2016) at 3pm. This season Ballet Manila celebrates local culture with Severino Reyes’ Mga Kwento ni Lola Basyang." 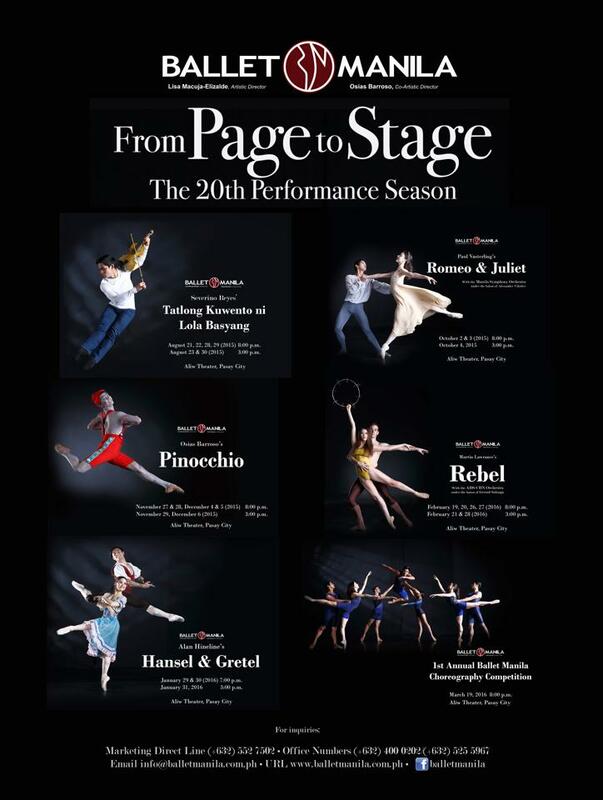 The next show, Paul Vasterling's Romeo & Juliet is their tribute to the classics while OsiasBarroso’s Pinocchio is the group's holiday offering. Martin Lawrence's Rebel is in line with Ballet Manila's Director's Choice International Series, followed by Alan Hineline’s Hansel and Gretel as special show dedicated to their young audience. Lastly, this year's premiere series is represented by the first "Ballet Manila Choreography Competition." The story tellers on toes continue to spread cheer with a grand production filled with love, fantasy and adventure. "We have romance, action, two fairy tales, make that five beautiful stories that we will tell you without saying a single word. The greatest love story of all time and the story of a puppet that wanted to become a real boy. A story about a prince that just so happened to be a bird. A story about an enchanted violin that makes people dance.A story about a brother's quest for his missing sisters.A tale about a brother and a sister getting lost in a forest and encountering a witch who wanted to eat them. And a world premiere celebrating the rebel within us all," she said. 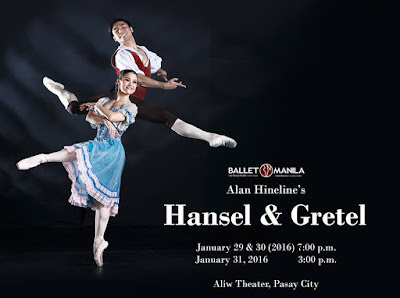 In addition to the season's attractions Ballet Manila also presents Hansel & Gretel, with choreographer by Alan Hineline, the Executive Director of Ballet Silicon Valley USA. The one act production is not just an enjoyable tale, it will also introduce children to the enchanting world of ballet. The story follows the forest adventures of Hanzel and Gretel leading them to a house made entirely of goodies and sweets. Alan Hineline’s Hansel & Gretel goes onstage at Star Theater January 29 &30, 2016 at 7pm and January 31, 2016 at 3pm. 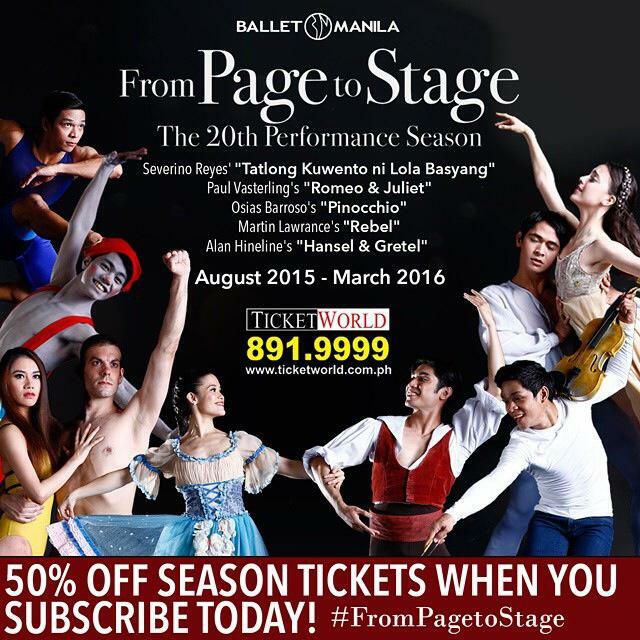 Ballet Manila marks 2016 with the launch of cutting edge competition for choreographers. True to its mission of celebrating the best Filipino artists, Artistic Director Lisa Macuja-Elizalde hopes to help new artists launch their careers in dance choreography. 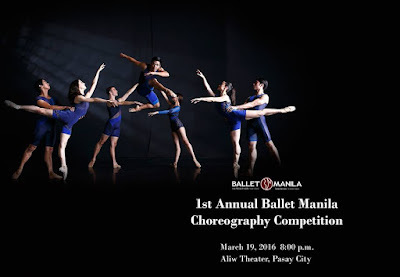 At stake are cash prizes and the rare opportunity to have their winning work presented by Ballet Manila. 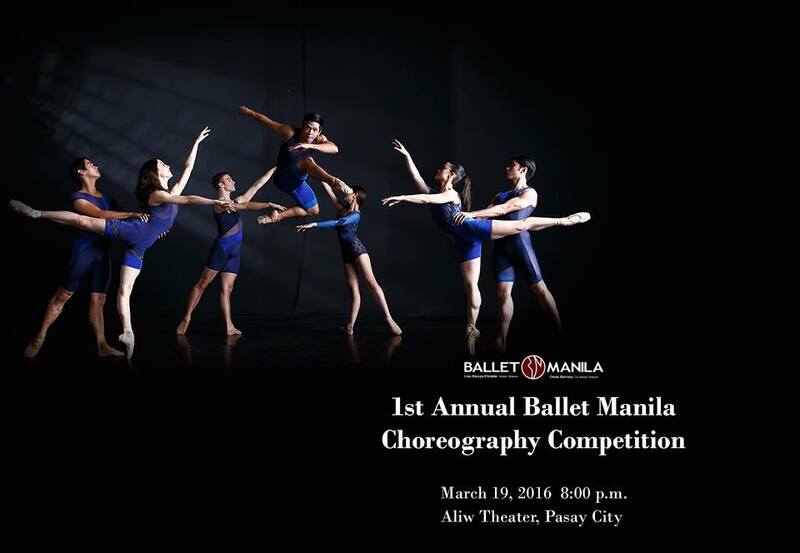 The "1st Annual Ballet Manila Choreography Competition" is set on March 19, 2016, 8pm at Aliw Theater. Season subscriptions and tickets for all shows are available via Ticketworld; visit www.ticketworld.com.ph, Ticketworld outlets, hotline 891 9999.